Lenovo ThinkAgile CP Series is an all-in-one, composable cloud with an integrated application marketplace and end-to-end automation, delivering a turn-key cloud experience in your own data center. ThinkAgile CP Series uses modular compute, storage, and networking components paired with the cloud virtualization software to create pools of IT resources, independently scaling and allocating capacity, and automatically configuring resources to fulfill application requirements. This product guide provides essential technical and pre-sales information on the Lenovo ThinkAgile CP Series cloud platform, its key features and specifications, components and options, and configuration guidelines. This guide is intended for technical specialists, sales specialists, sales engineers, IT architects, and other IT professionals who want to learn more about the ThinkAgile CP Series cloud platform and consider its use in IT solutions. Due to its software-defined modular architecture, the ThinkAgile CP Series platform can be scaled easily by adding more compute and storage resources independently of each other as your needs grow. Suggested workloads for the ThinkAgile CP Series include web services, virtual desktop infrastructure (VDI), enterprise applications, OLTP and OLAP databases, data analytics, application development, cost-optimized virtualization, containers, and other back-office applications. The following figure shows the ThinkAgile CP Series hardware components. Lenovo professional deployment services are included in ThinkAgile CP Series to get customers up and running quickly. Also included is the ThinkAgile Advantage lifecycle management with a single point of support for the entire ThinkAgile CP platform with the nodes, networking, and software components, for quicker problem determination and minimized downtime. Lenovo offers additional professional services that can be purchased for the ThinkAgile CP Series deployments, including hardware installation, software deployment, workload migration, cloud assessment and design, and ongoing managed services to help achieve optimal operations and performance. ThinkAgile CP is designed to minimize downtime with all of the components engineered to work together, and with tested, standardized and automated code updates. Modular and scalable ThinkAgile CP Series configurations of an on-premises cloud platform designed to optimize your workload’s performance and provide the IT agility for your business demands. Factory-preloaded ready-to-go cloud platform that is delivered with all the infrastructure you need for your workloads: Modular and scalable physical and virtual compute, network, and storage resources, and the cloud software. Lenovo deployment services that are included with the platform help get customers up and running quickly. The cloud software provides a scalable software-defined infrastructure (SDI) that simplifies cloud deployments with integrated compute, storage, networking, security, and management services that manage application infrastructure and automate and orchestrate workload provisioning. Extensive security features, such as data at rest encryption, virtualized network and VM-level firewalls, and two-factor authentication help customers meet the most stringent security requirements. Centralized cloud-based management automates discovery, deployment, and configuration of cloud resources, and provides automated, non-disruptive software updates. Lenovo ThinkAgile Advantage provides a single point of contact for all support issues and integrates support chat and virtual technical assistance into your management interface. Interconnect centralizes connectivity of your on-premises infrastructure to the Cloud Controller and acts as the entry point into your existing network, which connects the Cloud Controller to your environment. The CP Interconnect consists of one or two high-density, ultra-low-latency 10/40 GbE network devices and use specialized cloud software which provides the fabric for your composable environment, automating discovery, onboarding, and device management. Integrated network virtualization secures virtual data center and applications. Compute Block is a modular 2U enclosure that contains up to four nodes, and it delivers processor and memory resources to the cloud. The compute nodes run the cloud hypervisor that combines open KVM-based virtualization software, hardware integration, and automation to orchestrate and deliver an end-to-end compute platform. Storage Block is a 2U storage chassis with up to 24 PCIe NVMe SSDs and two controllers for high availability and redundancy. A storage block runs the cloud software that delivers data storage layer to the cloud. It simplifies storage management, provides enterprise-class storage functionality, and enables linear performance and capacity scaling. The 1 GbE management switch is required to provide out-of-band management for the Interconnect, Compute Blocks, and Storage Blocks. The switch can be supplied by Lenovo, or customers may provide their own switch. Cloud Controller orchestrates and manages the on-premises infrastructure and workloads; however, it resides in the cloud. It automates and orchestrates infrastructure provisioning in real time to achieve complete and secure vertical hardware, software and workload integration. It federates and abstracts all physical hardware into a private cloud service. Cloud Controller provides a single point of management across an unlimited number of ThinkAgile CP stacks with role-based access control, multi-factor authentication, and secure HTML and RESTful API interfaces. The following figure shows the port-side view of the ThinkAgile CP Interconnect. The following figure shows the non-port-side view of the ThinkAgile CP Interconnect. The following figure shows the front view of the ThinkAgile CP Compute Block. The following figure shows the rear view of the ThinkAgile CP Compute Block. The following figure shows the front view of the ThinkAgile CP Storage Block. The following figure shows the rear view of the ThinkAgile CP Storage Block. The following figure shows the port-side view of the RackSwitch G7052. The following figure shows the non-port-side view of the RackSwitch G7052. The following table lists the system specifications of the ThinkAgile CP Series. Warranty and maintenance Three-year customer-replaceable unit (CRU) and onsite limited warranty with 9x5 Next Business Day Parts Delivered. Optional service upgrades are available through Lenovo Services: 2-hour or 4-hour response time, 6-hour or 24-hour committed service repair, warranty extension up to 5 years, 1-year or 2-year post-warranty extensions, YourDrive Your Data, and Enterprise Server Software Support. Software Cloud Software Standard or Guardian editions. Memory 16 DIMM slots. Support for RDIMMs, LRDIMMs, or 3DS RDIMMs. ECC, SDDC (for x4-based memory DIMMs), ADDDC (for x4-based memory DIMMs, requires Intel Xeon Gold or Platinum processors), patrol scrubbing, and demand scrubbing memory protection. Memory capacity Up to 512 GB with 8x 64 GB LRDIMMs. Up to 1536 GB with 12x 128 GB 3DS RDIMMs. Boot volume 2x 2.5" Intel S4500 240GB Entry SATA 6Gb Hot Swap SSDs in a RAID 1 drive group. 2x 10 GbE SFP+ ports (Intel X722 LOM) connected to the Interconnect with two SFP+ DAC cables. 1x 1 GbE dedicated XCC management port (RJ-45) connected to the management network with one UTP Category 5E cable. Management features XClarity Controller (XCC) Enterprise (Pilot 4 chip), proactive platform alerts, light path diagnostics. Security features Power-on password, administrator's password, Trusted Platform Module (TPM) 2.0-ready. Cooling Five hot-swap system fans in the enclosure. Power supplies Two redundant hot-swap 2000 W (200 - 240 V) Platinum power supplies in the enclosure. Software Cloud Software Defined Compute (boot volume factory preload). Storage connectivity 8x 10 Gb iSCSI RJ-45 ports (4 ports per controller) connected to the Interconnect with four RJ-45 cables included. Management interfaces 2x 1 GbE RJ-45 ports (1 ports per controller) connected to the management network with two UTP Category 5E cables included. Software features Thin provisioning, snapshots, compression, deduplication, backup, asynchronous replication. Cooling Redundant cooling with five fans built into each of two hot-swappable controllers or expanders. Power supplies Two redundant hot-swap 2000 W AC power supplies. * The maximum quantity of the Storage Blocks depends on the interconnect port availability based on the quantity of the Compute Blocks. 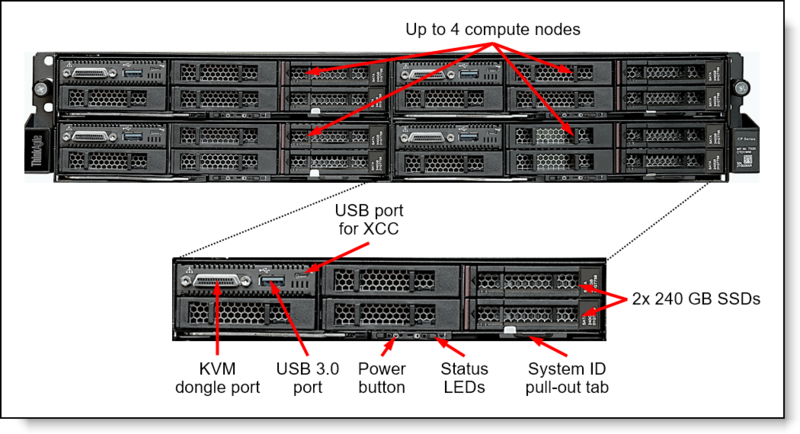 The ThinkAgile CP Series platform is designed for installation in a rack cabinet; the rack cabinet can be purchased from Lenovo (see Rack cabinets) or provided by the customer. Lenovo deployments services are included; they provide remote preparation and planning, configuring platform components, validating installation, transferring knowledge, and developing post-installation documentation. Lenovo basic installation services are optional; they provide mounting the components in a rack cabinet, connecting components to network and electrical power, checking and updating firmware, verifying operations, and disposal of the packaging materials within the customer site. The existing ThinkAgile CP deployments can be expanded up to the maximum number of modules supported by ordering the Compute Block, Compute Node, and Storage Block expansion models. The ThinkAgile CP Series uses CP-I-10 Interconnect to provide network connectivity and to control on-premises hardware and software. Interconnect decouples control, data and management traffic into different planes. 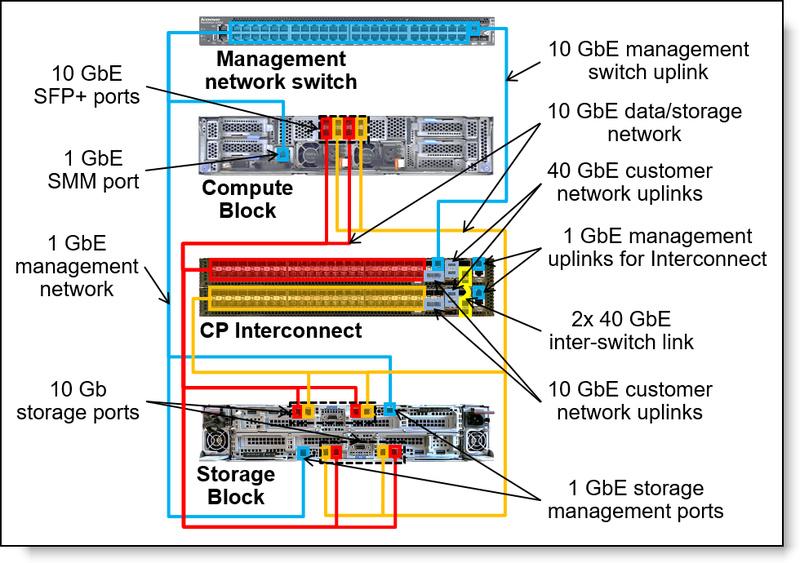 The CP-I-10 provides 10 GbE SFP+ connections for the Compute Blocks and Storage Blocks, and 10 GbE SFP+ or 40 GbE QSFP+ customer network uplinks. One of the CP-I-10 also provides one 10 GbE SFP+ connection to the management switch. One or two Interconnects can be selected for the CP4000 model, and the CP6000 model requires two Interconnects. A pair of Interconnects provides high availability and redundancy for the on-premises network infrastructure. If the pair of Interconnects is used, they are connected to each other by using two 40 GbE links. The following figure illustrates the network connectivity topology. Note: When only one Interconnect is deployed with the CP4000 model, all ports on the Compute Block and Storage Block are connected to the same Interconnect network device. The following table lists the ThinkAgile CP Interconnect model. One or two Interconnects are allowed for the CP4000 model; single-Interconnect configurations are not upgradeable. Two Interconnects are required for the CP6000 model. Each Compute Node requires one 10 GbE SFP+ port (4x 10 GbE SFP+ ports per Compute Block) on each of the Interconnects. Each Storage Block requires four 10 GbE RJ-45 ports on each of the Interconnects. The following tables list transceivers and cables that are available for selection for the Interconnect SFP+ and QSFP+ ports. * The transceivers are for the SFP+ Interconnect ports. The ThinkAgile CP Series uses CP-CB-10 / CP-CB-10E Compute Blocks that provide processing resources to the cloud. Each Compute Block supports up to four CP-CN-10 / CP-CN-10E Compute Nodes. The following table lists the Compute Blocks and Compute Nodes for ThinkAgile CP Series. A maximum of one Compute Block CB-10 is supported for the CP4000 model. A maximum of ten Compute Blocks CB-10 is supported for the CP6000 model. Each Compute Block CB-10 supports up to four Compute Nodes CN-10. The Compute Block Expansion CB-10 and Compute Node Expansion CN-10 are used to add compute capacity to the existing ThinkAgile CP Series deployments up to the maximum number of modules supported (See Interconnect for details). The Compute Node requires two processors of Intel Xeon Processor Scalable Family. The following table lists feature codes of the supported processors. The Compute Node support RDIMMs, LRDIMMs, or 3DS RDIMMs. Mixing different types of memory (RDIMMs, LRDIMMs, and 3DS RDIMMs) is not supported. All DIMMs in the appliance must be of the same type and capacity. The following table lists memory selection options available for the ThinkAgile CP Compute Nodes. Each Compute Node has two 240GB SATA hot-swap SSDs configured in a RAID-1 drive group for high availability to boot the cloud software. The following table lists SSD selection options. Both SSDs in the Compute Node must be of the same model. For the management network, the Compute Block uses 1 GbE connectivity with the onboard 1 GbE port on the SMM. For the data network, the Compute Node provides two-port 10 GbE SFP+ network connectivity with the onboard Intel X722 NIC on the node and an Ethernet I/O Module (EIOM) installed in the Compute Block. For more information, see Interconnect. The following table lists the Storage Blocks for ThinkAgile CP Series. A maximum of one Storage Block SB-S10 is supported for the CP4000 model. A maximum of five Storage Blocks SB-D20 is supported for the CP6000 model. The Storage Block Expansion SB-D20 is used to add storage capacity to the existing ThinkAgile CP Series deployments up to the maximum number of modules supported (See Interconnect for details). The following table lists the drive options for Storage Blocks. For the existing deployments, the storage expansion drive options are available in the bundles that include the drive packs and storage capacity software licenses (Standard or Guardian for up to 5 years). For more information on licensing, refer to Software. The following table lists the drive expansion bundles for Storage Blocks. The management network switch is a 1 GbE RJ-45 switch that connects SMM management ports on the Compute Blocks and management ports on the Storage Blocks. The management switch also provides one management uplink to the first Interconnect. The management switch can be purchased from Lenovo or provided by the customer. The following table lists the management switch that is available from Lenovo. The following tables list cables that are available for selection for the management switch. The following table lists the power cable options that can be selected for the ThinkAgile CP Series components. Two power cables are required per each Compute Block, Storage Block, and Interconnect. One power cable is required for the G7052 management switch. The ThinkAgile CP Series components ship with factory-installed cloud software and a Cloud Controller license. The cloud software is available in two editions: Standard and Guardian. The Standard edition is based on Cent OS, and it provides data-at-rest encryption that is compliant with KMIP. The Guardian edition is based on Red Hat Enterprise Linux (RHEL) 7, and it provides stringent security with encryption that is certified for FIPS 140-2, STIG, Common Criteria, and USGv6. For Compute Blocks, the cloud software is licensed on the per-core basis. For Storage Blocks, the cloud software is licensed on the total storage capacity basis. For Interconnect network devices, the cloud software is licensed on the per-device basis. The software licenses are available for 3, 4, and 5 years. The following table lists the cloud software licenses. The ThinkAgile CP Series components include a three-year customer-replaceable unit (CRU) and onsite limited (for field-replaceable units [FRUs] only) hardware warranty with 24x7 ThinkAgile Advantage Single Point of Support (Lenovo server hardware and the cloud software) and 9x5 Next Business Day Parts Delivered. The Lenovo local support centers perform problem determination and resolution. Lenovo Enterprise Server Software Support can help you troubleshoot your entire server software stack. Choose support for server operating systems from Microsoft, Red Hat, and SUSE; Microsoft server applications; or operating systems and applications. Support staff can help answer troubleshooting and diagnostic questions, address product compatibility and interoperability issues, isolate causes of problems, report defects to software vendors, and more. The following table lists the approximate dimensions and weight for the ThinkAgile CP Series components. The following table lists maximum power load and heat output for the ThinkAgile CP Series components. The following table lists the rack cabinets that are offered by Lenovo that can be used with the ThinkAgile CP Series. The following table lists the power distribution units (PDUs) that are offered by Lenovo that can be used with the ThinkAgile CP Series. The following table lists the uninterruptible power supply (UPS) units that are offered by Lenovo that can be used with the ThinkAgile CP Series.